Oregon Ducks, How Do I Love Thee? Let Me Count the Ways. Months away from the start of the season, one of the things that tide us over is our love for the Ducks. 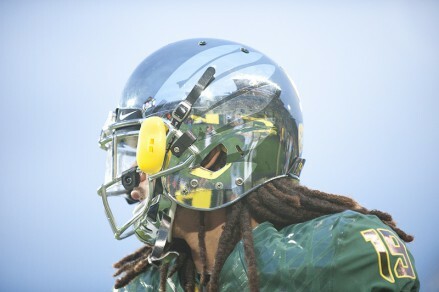 One of the many Oregon helmets. Throughout the off season, we remember great games, plays and quoteables, as well as looking forward to what the new season will bring. We remember the tailgating and gameday house parties of this last year, we shop for new Duck stuff (you don’t need to wait until the season for that) and we miss the feeling of football in the air. It isn’t possible to list all the reasons why we love our football team — but here are just a few of the (many) reasons. Whether you are a born and raised Duck fan, a tie-died convert or just joining the show, one of the things you love about Oregon football is the Oregon football brand. If you live in the deep, dark woods of SEC country, or in heart of the ACC, Big Ten, or Big 12, you already know about Oregon football. At the mention of the word “Ducks,” people start talking about the flashy uniforms, the big plays, the incredible speed and the amazing facilities. 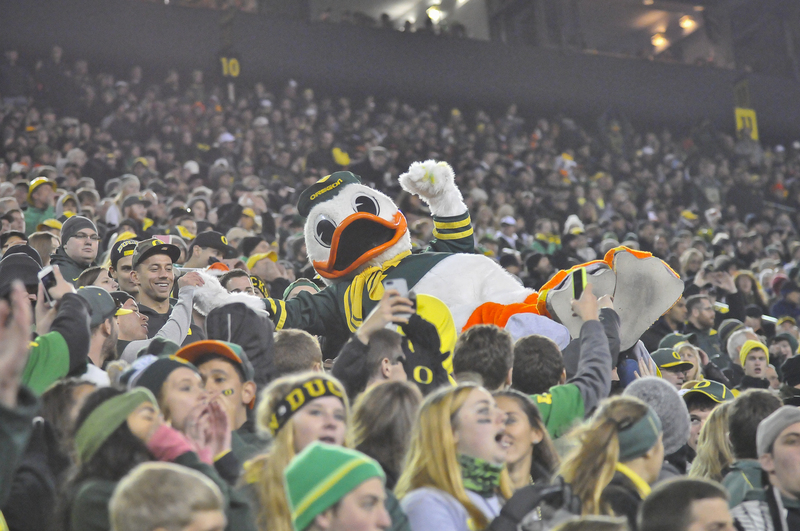 Most are jealous, some are awestruck, but they all know exactly what the Oregon brand entails. Mariota hanging onto the ball. Sitting at the edge of your seat, whether at home on your comfy couch or at Autzen Stadium, watching an Oregon football game is more than just exciting. Our quarterbacks lead the action-pack parade and seem to be getting better at it all the time. 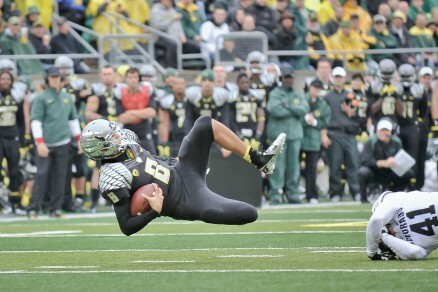 From Akili Smith to Joey Harrington, to Dennis Dixon, Jeremiah Masoli, Darren Thomas and, most recently, Marcus Mariota, each quarterback advances Oregon with lightning-fast leaps and bounds. 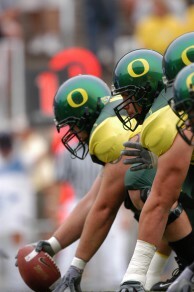 In the past 10 years, our running game has given us starters such as Jonathon Stewart, LaMichael James and Kenjon Barner, and brought many future stars such as Byron Marshall and Thomas Tyner, to Oregon. The future at Oregon remains bright with the great backfield recruits the program continues to attract. 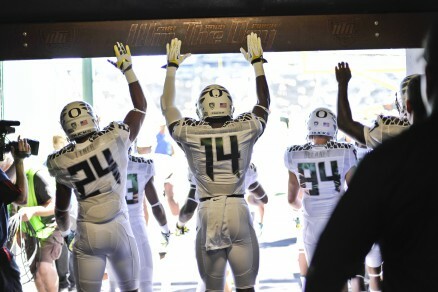 The entire Oregon offense is really amazing to watch. Every play is explosive and no fourth down is a guaranteed punt. Remember the fake punt against UCLA? They move like a well-oiled machine and watching the opposing defenses try to keep up makes for great games for the fans. 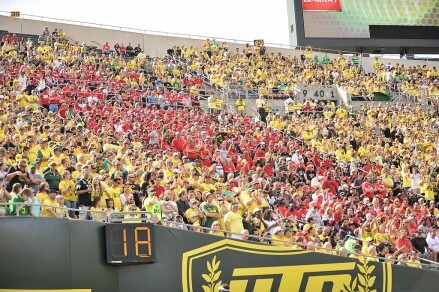 How can you talk about Oregon and not talk about Autzen Stadium where Duck fans live? Stepping into Autzen Stadium on game day is a feeling unlike any other. The electricity, the anticipation and the insanity packed inside the stadium are a nightmare for opposing teams. The pin-drop silence on important Oregon plays and the deafening roar that makes other teams flinch, send a jolt of satisfaction to every Duck fan (standing and yelling) in the stadium. The trash talk – especially if you happen to be near opposing team fans – the high fives, the groans and/or boos of disapproval when a call doesn’t go Oregon’s way and the screams and shouts of approval when something goes right for Oregon. It doesn’t matter if you are in the first row of the 50-yard line or at the last row of any section — there are no bad seats. You soak it all up, you jump and scream until your voice is gone and you are finally exhausted while cheering our Ducks on to their latest victory. 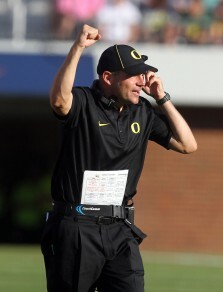 Head Coach Mark Helfrich celebrating an Oregon victory. Oregon has an amazing reputation for keeping coaches at Oregon for a large part of their careers and for promoting from within. Mike Bellotti was Offensive Coordinator for Rich Brooks and became head coach after Coach Brooks left for the NFL. Mr. Bellotti brought in Chip Kelly, as his Offensive Coordinator (OC), who then became head coach while he, Bellotti, went on to become U of O’s Athletic Director. When Chip Kelly left the Ducks for the Philadelphia Eagles, Oregon once again promoted from within as OC Mark Helfrich was promoted to head coach. When Nick Allioti retired at the end of the 2013 football season, no one was surprised that the Ducks looked inward to find their next DC, Don Pellum. No one can deny that promoting from within and keeping coaches happy so they stay at Oregon, hasn’t helped the Ducks become one of the strongest programs in the country. Win the Day. Everyone knows exactly what it is and what it means to both the team and to the fans. They both have bought into focusing on one day at a time and giving that one day everything you’ve got. Win the Day means winning against a nameless, faceless opponent. It means preparing for and playing against every team as if they were the best. Giving everyone the same respect and working their hardest to come out a winner. 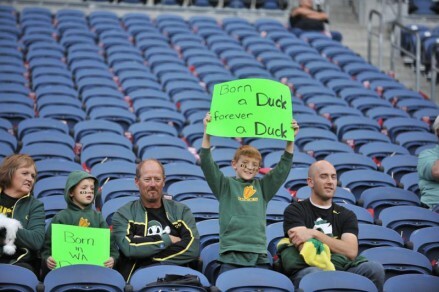 What started out as an inspirational tool for the team, has become as much of a part of Duck football lore as anything. Before heading out onto the field, players slap the ‘Win the Day’ emblazoned in the tunnel. And most of the time, they do just that — they Win the Day. Ready to live out the Mantra. During the offseason, there remain a few Duck football tibdits during the drought of excitement — the recruiting, spring practices, preseason news and summer training camp. But it is the love of our Duck football team that keeps us going, until we once again enjoy the electric anticipation when they take the field in the fall.